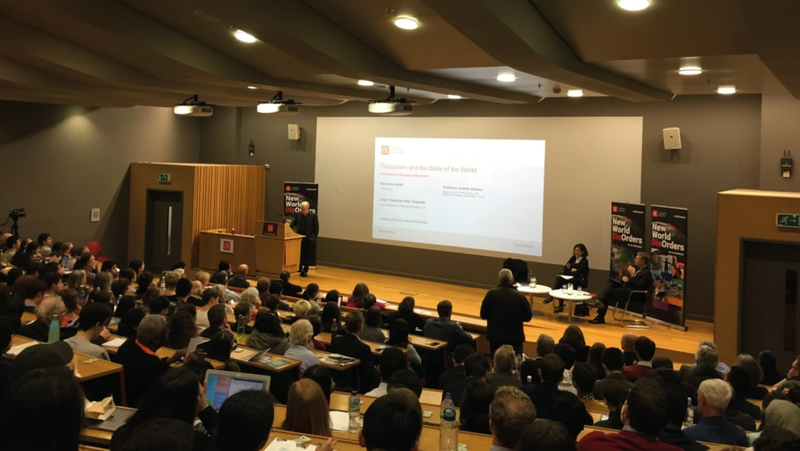 The London School of Economics (LSE) held its week-long New World DisOrders Festival from 25 February to 2 March – a series of events, exploring the role of social sciences in tackling global issues. Speakers touched upon the current shifting of geo-politics, failing democracies, identity crisis and technological transformations – thereafter responding to the comments and questions of a highly opinionated and diverse audience. The opening event, Pessimism and the State of the World, included a talk by Professor Andres Velasco, the inaugural Dean of the new school of Public Policy and former Minister of Finance in Chile (2006-2010) and Minouche Shafik, Director of LSE and previous Deputy Governor of the Bank of England. The description of the event was to show why some of the richest countries are still miserable, where anger and anxiety came from that is manifested in populism and terrorism, and are we, despite the massive gains in material progress, living in an age of insecurity? Both speakers did well in displaying how pessimism is often the result of misguided human psychology. Prof Andres Velasco spoke of “local optimism and national pessimism” where the populace describes their own socioeconomical condition as positive but sees the world at large in a negative light. Prof Velasco opened his speech by saying, “It is the first decade in human history where people are dying more from eating too much than too little”, pointing towards the economic growth of the world. He also continuously referred to Steven Pinker’s book The Better Angels of Our Nature, a book which highlights the fact that the world is better, more progressive and safer than any point in human history. The speakers commented on the role of the media and its continuous agenda to only report on what is negative, thereby influencing the perception of a continuously dangerous world. The failings of democracies and the lack of trust in governments were also to blame for pessimism in the world. Both speakers agreed that the world is better than what people imagine and that our future, as humans, is something to look forward to. However, their effort to portray the world and its future in positive light was taken with a pinch of salt by the audience as a vote taken on whether the audience was optimistic or pessimistic about our future proved to be a fifty-fifty standing, with 51% optimistic and 49% pessimistic. Populism was a recurrent theme at events throughout the New World DisOrders Festival. One such talk was by Elif Shafak, an award winning British-Turkish novelist and the most widely read female author in Turkey, and a two-time TEDGlobal speaker. Her talk was named How to Remain Sane in the Age of Populism and aimed to answer why sentiments of “fear, anger, anxiety and resentment” were spreading and the role of populist and tribal ideologies. Shafak began her talk by admitting, “It may sound like I have the answer, but I don’t” – the statement was one which resonated with a plethora of other speakers as well. However, Shafak did go on to pan out her observations for the rise of populist ideology. She scanned history and pointed out the optimism through which humanity once breathed; the fall of the berlin wall; the breakup of the USSR; the establishment of democracy; the World Wide Web; the Arab Spring which would be the Facebook revolution and Iran which would be the Twitter revolution. The British-Turkish author discussed the change in recent literary habits which point towards a dangerous rise of rightists; a prime example being the highly racist 1973 novel Camp of The Saints rising to become the bestseller in 2011 across the USA and France. The novelist also drew on the hypocrisy of right-wing populists; they were part of the political or financial elite, the likes of Geert Wilders, Nigel Farage and Donald Trump being prime examples. The overall reason for right-wing support was the emotional connection and feeling of “safety” that populists offer in their nostalgic views, further cemented by the lack of trust the populace have in governments. The British-Turkish author called for a “more humanistic environment”, but admitted that she did not have the answer to the problems. The dangerous and often fatal journeys refugees endure to find safety, shelter and justice were documented across countries including Syria, Iraq, Afghanistan, Greece, Germany, Palestine, Kenya and Mexico. Thought-provoking quotes appeared on screen throughout the viewing, one being “When there is nowhere to go, nowhere is home”. Human Flow not only displays the plight of refugees but demonstrates how the West has begun to close its borders to those in need. The documentary urges for human compassion, acceptance and tolerance at a perilous time. It asks the defying question on whether our global society will emerge from fear, isolation, and self-interest and choose a path of openness, freedom, and respect for humanity? The line between cultures is becoming increasingly vivid throughout the West with the rise of populists and right-wing ideologies. LSE organised a tremendously insightful talk called “Us” and “Them”: Populism and Religious Identity in the West. The event took place at the Sheikh Zahid Theatre and was chaired by the founding director of the LSE Faith Centre, James Walters. The panel included Tobias Cremer, a PhD candidate at the Department of Politics and International Studies (POLIS) at Peterhouse, Cambridge University. His doctoral research focuses on the relationship between religion and the new wave of right-wing populism in Western Europe and North America. Also in the panel was Zubaida Haque, Deputy Director at The Runneymede Trust with a strong research and policy background in integration and extremism. Tobias Cremer demonstrated how the right wing are playing identity politics, using religion as a marketer; often displaying religious symbols and chants. He asked the audience to imagine the oversized crosses people were carrying in front of Dresden Frauenkirch Church (Germany) whilst occasionally chanting Christmas carols and church hymns. He drew a picture of the thousands who rallied at former capital of Laïcité (secularism) in veneration of a Catholic saint. He then told the audience that none of these were religious services or gatherings, instead they were organised by right-wing populist movements. Cremer pointed out that although it appears as though right-wing populists are recruiting the most devout of Christians, it is simply not true. Drawing on polls, Cremer pointed out that supporters of right-wing populists are nonpracticing, irreligious people. A prime example was the Alternative for Germany (AfD) “who does double as well with the non-religious than that of church-goers”. He said the reality was that people who enter far right parties were “populists first, then Christians” – it is more of a cultural clash, he explained. Highlighting the reality behind the propaganda, Cremer said, “It is a secularisation of religion, using it as a cultural identity … they marry religious symbols with secular symbols”. This strategy aims to vividly draw the line between “us” and “them”, he noted. The PhD candidate discussed how “them” has been defined as Muslims and thus Christianity must be the cultural identifier of “us”. He highlighted the reality behind so-called populist leaders who claim to be torchbearers of religion, one example being the Italian right-wing politician, Matteo Salvini, who wants to stamp out Islam and establish a “true Christian life” within Italy. The reality was that Salvini, only years ago, identified as a Pagan and professed that Christianity was a “weak faith”. Tobia Cremer aims to draw up his conclusions in his final thesis on the topic. Zubaida Haque discussed the successful strategies of populists who use “cultural loss” as a means of gaining support. She said, “The Right are very good at hijacking Christianity for its whiteness … they are clever at focusing on cultural loss rather than economic loss. And you cannot measure cultural loss.” When you cannot measure a loss, it is more emotional than factual therefore people feel iffy when a Muslim moves next door; a “feeling” that the Muslim is against their culture, she explained. Zubaida focused on how the Right were separating Muslims from Islam. She said, “They have separated Muslims and Islam, they say the problem are the beliefs not the person”. By attacking Islamic teachings, like the Burka, the Right aim to create a sense of cultural clash. People, in turn, fear an introduction to a culture which somehow opposes their own, Zubaida highlighted. Thus, “Islam is seen as an extremist ideology not as a religion … They’ve taken an extremely diverse group and homogenised it” explained Zubaida. 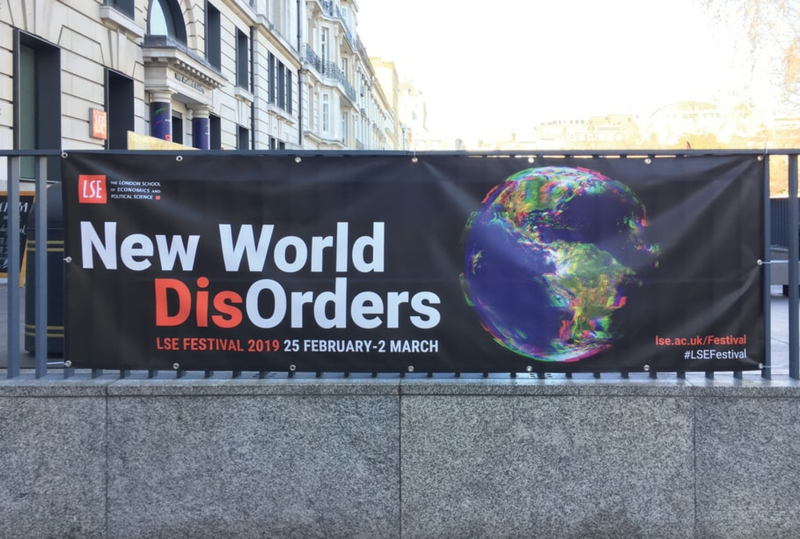 The closing event of the New World DisOrders Festival at the LSE was the New World Order 2035. LSE lecturers presented their views on how the world would be in 2035 and what aspects we needed to focus on as a global community. The comments by the speakers were generally positive and painted a world of optimism. The poll which was taken at the beginning of the Festival about whether the audience contemplates optimistically about the future or pessimistically was taken again. This time, the optimists scored (a little) higher with 57% optimistic and 43% still pessimistic. I felt the festival presented valuable insight into our world of “disorders” and a lot was learnt. However, I feel that key global issues were brushed aside without much contemplation. My greatest concern was what Hazrat Khalifatul Masih Vaa has been continuously warning about – the formation of global blocs and the plausible catastrophe of nuclear warfare. I asked many speakers after the event about their views on the matter, to which they responded with equal fear and anxiety without a definite answer; some reiterated that world leaders are not “stupid” enough to use such a destructive force, which we hope. Speakers at all the events during the New World DisOrders Festival were not entirely sure of definite solutions. One event to find answers, will be on the evening of Saturday, 9 March 2019 at the UK Peace Symposium, where Hazrat Mirza Masroor Ahmad, Khalifatul Masih Vaa will, once again, present his solutions to world disorders.